some general information about the process. 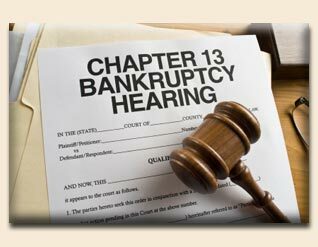 Most bankruptcies are either Chapter 7 or Chapter 13. Chapter 7 is often referred to as simple bankruptcy. Chapter 13 is for those who can't meet the requirements of Chapter 7 and is typically used to allow people to catch up, over time, delinquent amounts on secured assets such as real estate, vehicles, etc. In a Chapter 7 bankruptcy, a debtor is allowed to keep a certain amount of property that the law deems exempt. In most cases, this is all of your personal and real property. A Chapter 7 debtor can keep a vehcile or house and continue making payments under a Chapter 7 if the debt is current at the time of filing. In a Chapter 13 proceeding, creditors are paid a percentage of their debts (typically 10-20%) over time, anywhere from 36 to 60 months. This proceeding is typically used to stop foreclosure or repossession. In addition, Chapter 13 is also used where the Debtor has too much equity in certain secured assets such as houses or vehicles. Bankruptcy can be filed to also stop wage garnishments and assigments, in addition to foreclosure and repossession. support and maintenance obligations, and others.